Our sweet, wild, cuddly, toddler animal baby gave us a run for our money this weekend. We love him so hard but goodness are we ready for bedtime some nights! 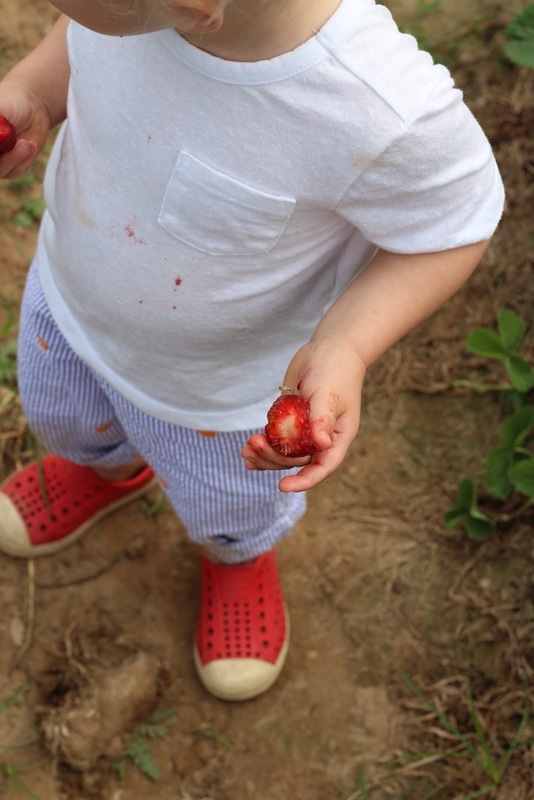 We tried to do a nice, normal family thing and go strawberry picking this Saturday and it was pure perfection. Who fell in love with that Toyota (and it's dirty tires) behind us moments after this shot. Head over heels in love. Which was perfectly fine with us until the owner of said tires needed to leave. And then my son threw himself onto the front bumper of a stranger family's car and sobbed himself into a stupor. In other news, this month is going to be insanely busy. I hop a flight on Monday morning to Austin, Texas so that I can present at the Creative Counsel Conference! I am so excited to meet everyone and visit Austin for the fist time - and to sleep in a hotel room solo. Yep, I said it. Willow Crowns is launching our Summer Collection, my One Room Challenge Living Room will finally be finished and Justin and I will celebrate our anniversary by attending the wedding weekend of one of my bridesmaids. Travel, celebrations, food, champagne, family, toddler baby. I have a feeling it's going to be an amazing (-ly fast) month. I'm working on a fun new blog series and hope to put the finishing touches on a few posts on the plane tomorrow so stay tuned this week, especially if you're a fellow blogger. See you kids in the Lone Star State! Oh my gosh G is SO cute! His hair is everything! Hope you have a safe trip tomorrow! I so wish I was going to be there in Austin! With me starting a new job, I just couldn't swing getting away mid-week. I love his little seersucker shorts! I know I say this all of the time, but G's blonde hair!! I can't get over it! Have a fun week mama!! Say hello to my fellow Texans! !